Coventry City defender Tom Davies faces a lengthy spell on the sidelines after breaking his collarbone in Saturday's 2-1 defeat at Forest Green. And Sky Blues boss Mark Robins has also lost fellow defender Jack Grimmer with a hamstring injury. Right-back Grimmer could face several weeks out, while centre-half Davies is expected to be out for two months. "Tom has fractured his collarbone, so that is going to be a while, " Robins told BBC Coventry & Warwickshire. "It was a costly game in terms of losing bodies. "We don't know how bad Jack Grimmer is. He did it over-stretching for a tackle. "And Chris Stokes has also picked up a problem. He stretched for a ball when his hamstring was already tight. He had to finish the game, so whether there is a tear there, who knows." 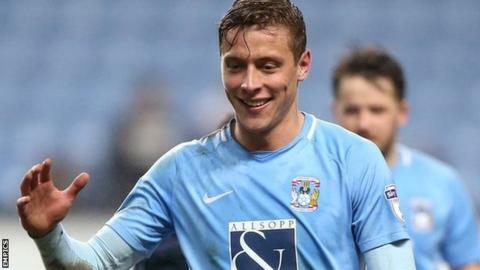 The Sky Blues' fourth defeat in five away league games, just a week after winning at League One side MK Dons in the FA Cup, dropped Robins' men out of the play-off zone to eighth, a point behind seventh-placed Swindon Town - and now four off the automatic places. "There has been a lot of plaudits being given to the players over the last couple of weeks," added Robins. "They need to stop reading their own press, work hard and overcome the issues we have away from home. It's just really disappointing that, having got into a good position, we're making life difficult for ourselves." City would get back into the top seven if they win at home to fifth-placed Accrington this Saturday. But they then face a potentially season-defining four successive away matches - three in the league, as well as the FA Cup fifth-round clash at Premier League side Brighton on 17 February. And all three league games are against fellow promotion rivals, 10th-placed Colchester United, fourth-placed Mansfield Town and second-placed Wycombe Wanderers.